Those nice people at NOW TV are celebrating the release of the tiny low priced box, that offers a selection of streaming services by launching a website based game that lets you save the £10 cost of the box and win one for free, and the big prize is a 42 Inch LGTV. The streaming box is used by Sky as a vehicle for bringing NOW TV service to users who do not own a Sky box or a connected device, but do want to watch the programming they offer. Users can sign up for Access a great range of live and catch-up channels with Sky News, BBC iPlayer and Demand 5. The only problem is that the services available for the cheap box are anything but cheap. A day pass for Sky Sports costs as much as the box, an eye watering £9.99 for 24-hours. You do get full access to all sports channels including Sky Sports F1. The movies are a better deal though, with a subscription to Now TV Movies costing £8.99 monthly for three months and then £15 per month. Read our guide to finding the best streaming box here. To celebrate the launch of the NOW TV Box, the tiny device which turns your TV into a smart TV and opens up a world of Sky content for an unbeatable price of £9.99, NOW TV have launched the #NOWTVBox Hunt campaign which aims to let people ‘look through the eyes of the box’ and guess where in the world they are. 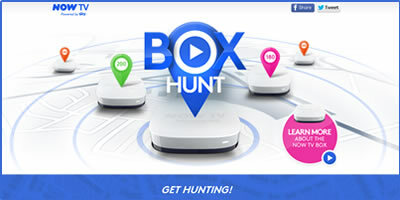 Users are encouraged to visit the #NOWTVBox hunt website, where they’ll be dropped into a location relevant to film and sports content available on NOW TV using some neat Google Maps and Street View integration. They must then guess where in the world they are by placing a pin on a world map. They can get clues to the content and location by sharing to Facebook and Twitter and guessing which film or sports event the location is from. Points are then awarded based on how far the pin was dropped from the actual location, with the highest scorers each day winning TV’s and NOW TV Boxes. The aim of the campaign is to raise awareness of the NOW TV Box and highlight the Sky Movies, sports and entertainment content available, all without a contract. The campaign launches today and runs until 25th October and you can get involved here: www.nowtvboxhunt.co.uk.